Solution phase transformation of HMX Form II (upper left) to HMX Form I (lower right) (45 minutes later) in acetone at room temperature. Photomicrographs are reproduced from Walter C. McCrone’s original 1944 research on explosives during World War II. See Editorial: A Legacy of Polymorphism in Crystals, page ii. 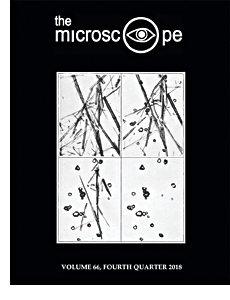 Excerpt: Joel Bernstein, Global Distinguished Professor of Chemistry at NYU, contacted me about 3 years ago seeking permission to use some of Walter McCrone’s texts and figures in reference to an article published in The Microscope in 1982 and in classroom appendices from when he had attended our Chemical Microscopy course at Cornell University in 1984. Dr. Bernstein is author of the book Polymorphism in Molecular Crystals (Oxford University Press, 2002) and was preparing for the second edition. He wished to include a whole section on the search for solvents and was interested in Dr. McCrone’s method of determining the solubility of single subnanogram particles in any number of different solvents quickly, using a microscope slide, glass ring, and coverslip, and still have all of the material left when finished. I would also like to point out that Dr. Bernstein’s chapter on polymorphism of high-energy materials (aka organic high explosives) in the first edition is extremely well presented, especially the section that includes Dr. McCrone’s original research on HMX during World War II (see this issue’s cover and a related article in The Microscope, 41:4, pp 161-182, 1993). Unfortunately, Dr. McCrone died the same year Bernstein’s book was first published, and to my knowledge, he was not aware of it. Abstract: Steam-powered locomotives have been in operation since the 1830s, and since the late 1800s, most of the steam systems were insulated with asbestos-containing material (ACM). Other ACM associated with railroads included gaskets, packing, rope, brakes, and construction materials. Most steam-era locomotives were removed from service during the 1950s, although some continued operating into the 1960s. Steam locomotives today are used in the U.S. only for scenic and heritage tours, while many remain as static displays in towns and museums around the country. The results of bulk samples collected from steam locomotives on display demonstrate that large quantities of ACM remain associated with this old equipment. Amosite and chrysotile were the most common forms of asbestos found in U.S. stock, although crocidolite and anthophyllite have been reported in the scientific literature in other countries. Organizations undertaking to restore steam locomotives should apply recognized asbestos control measures when disturbing or removing these materials. Excerpt: Excrement may be repulsive, but the study of dung casts light on many ostensibly unrelated aspects of civilization, including a fascinating microscopical view of bacterial communities. Excerpt: Electromagnetic wavelengths utilized by transmission electron microscopy (TEM) are invisible to the naked eye, therefore the image the TEM produces must be viewed indirectly by focusing the image onto a photographic plate, a digital image capture device, or a phosphor-coated fluorescent screen. Due to the response time (decay rate) achievable by phosphor materials, many TEM analysts prefer to use the phosphor screen for rapid functions, like scanning a grid opening for particles of interest or adjusting beam parameters. Analytical test methods, such as the asbestos fiber counting promulgated by the National Institute for Occupational Safety and Health, the Environmental Protection Agency, ASTM International, and the International Standards Organization (ISO), allow for fiber sizing via calibrated phosphor screen markings. Some of the test methods describe a requirement of using such calibrated screen markings to measure particle dimensions to the nearest 1 mm (on screen dimensions) without any real restriction or advice on how to approach such a measurement. Originally published in The Microscope, Vol. 26, Third Quarter, pp 143 – 153, 1978. Abstract: Fractography has been used as a destructive test to determine metal quality, grain size, and quality of heat treatment since the 16th Century. The science of fractography began in the late 1930s when fracture textures were first related to the phenomena of hydrogen embrittlement. An understanding of the four basic fracture modes and precipitating causes can result in a more thorough understanding of the cause of fracture and can lead to an appropriate solution. The emergence of the SEM as a metallurgical research tool has been due to the tremendous wealth of knowledge that the SEM has provided in the last 15 years. Four distinct types of failure: ductile failure, two types of brittle fracture (cleavage and intergranular), and fatigue failure show distinct types of fracture surface pattern. 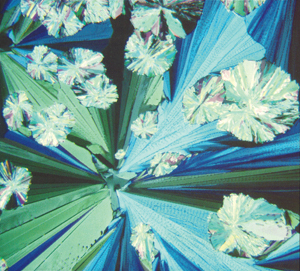 Although the light microscope may yield important information concerning the mechanism of failure, the SEM, with its high resolving power and great depth of field, is the instrument of choice when a full understanding of the fracture mode is required. Two polymorphic forms of the explosive Tetryl (trinitrophenyl nitramine) in a fusion preparation.